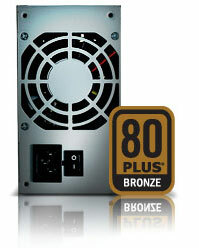 Shuttle XPC newly developed 300W and 500W PSU has received 80 Plus Certification, proven to be one of the most energy efficient PSUs on the market. 80 PLUS is an initiative to promote energy efficiency in computer power supply units (PSU). It certifies products that have more than 80% energy efficiency at 20%, 50% and 100% of rated load, and a power factor of 0.9 or greater at 100% load. That is, PSUs that waste 20% or less electric energy as heat at the specified load levels.